Oceanco’s latest launch, the 248’ Anastasia, collected a World Yachts Trophy in Cannes last fall. 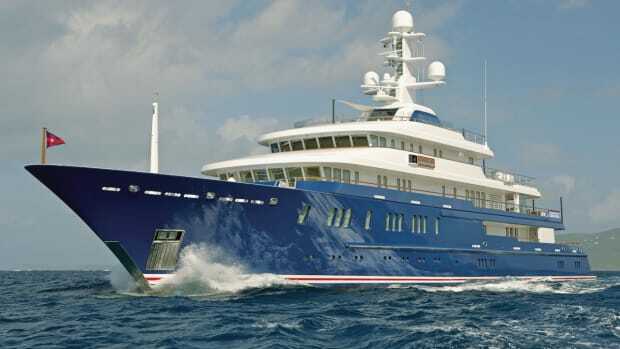 Although both were built at Oceanco as steel displacement hulls with bulbous bows, the vessels, formerly known as Y-702 and Y-703 respectively, are vastly different yachts, illustrating the yard’s ability to take on a wide variety of projects and master diverse technical challenges. 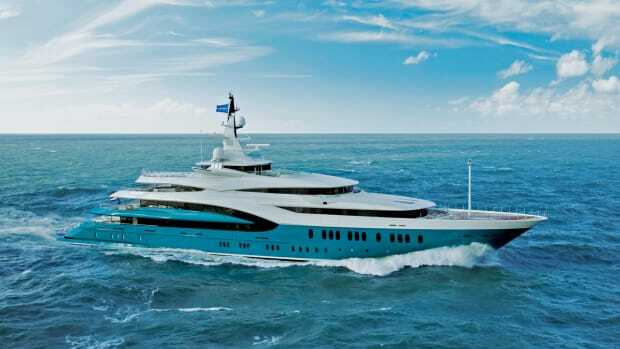 Dutch mega yacht builder Oceanco has earned seven awards for its recent megayacht launches. The 269’ Alfa Nero continues to receive kudos more than a year after it burst onto the megayacht scene, most recently receiving an International Superyacht Society Award and an International Boating Award. Oceanco’s latest launch, the 248’ Anastasia, collected a World Yachts Trophy in Cannes last fall. 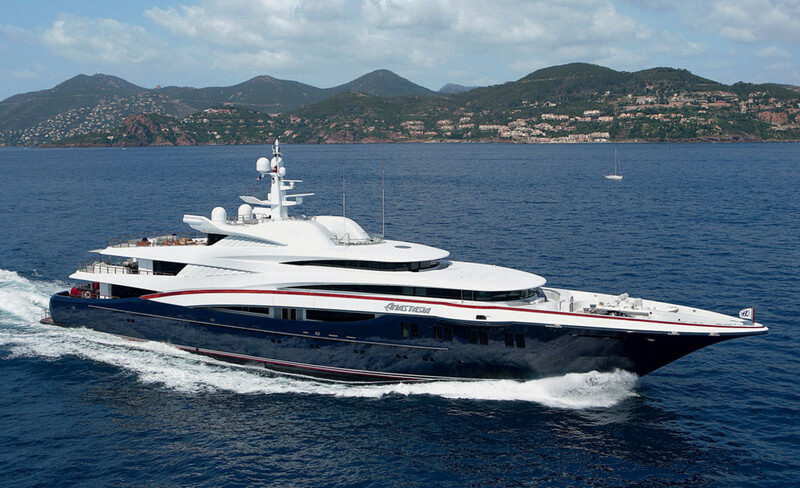 Although both were built at Oceanco as steel displacement hulls with bulbous bows, the vessels, formerly known as Y-702 and Y-703 respectively, are vastly different yachts, illustrating the yard’s ability to take on a wide variety of projects and master diverse technical challenges. 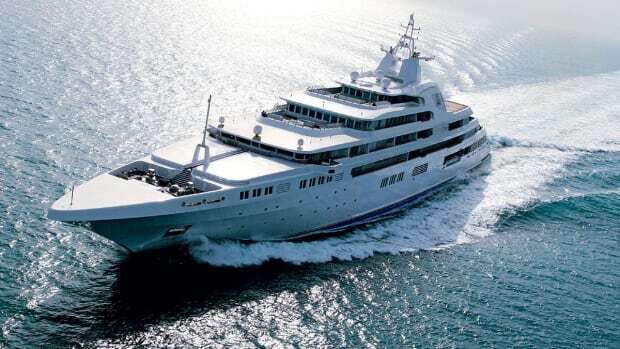 Anastasia is a very private yacht inside and out. The design by Sam Sorgiovanni favors a series of secluded spaces. Technical elements, including life rafts, tenders, anchors and mast (which can be folded), are largely concealed from view, allowing the elegant and classic yacht profile to fully reveal itself. A fluid white aluminum superstructure comprised of a series of elegant “folds” tops a stunning blue hull with dramatically raked bow. A custom paint scheme closely mimics wood, to provide an interesting contrast element for the cap rail. The faux wood finish, which proved to be a more practical solution than actual wood but still lends the yacht a classic touch, is also found on the yacht’s transom, where the hand-painted detail can be admired up close. Very little distracts from the yacht’s fluid exterior design, which aptly conceals the yacht’s seven decks. “The intent was to create a new and distinctive look, to play with curved lines, the interaction of window lines, hull and decks,” Sorgiovanni said. “My objective was to create a form that was interesting, to give visual excitement and interest where the deck levels were made virtually impossible to follow from bow to stern”. The shipyard successfully integrated technical elements, in agreement with the owner’s and designer’s vision, even if, as Oceanco’s Managing Director Eel Kant conceded during our visit at the yard a few months ago, doing so presented a number of challenges. In addition to the interior and exterior design’s intricate details, the yacht has many moving parts such as the aft Jet Ski platform and the boarding platforms. Then again, Oceanco is no stranger to technical feats. 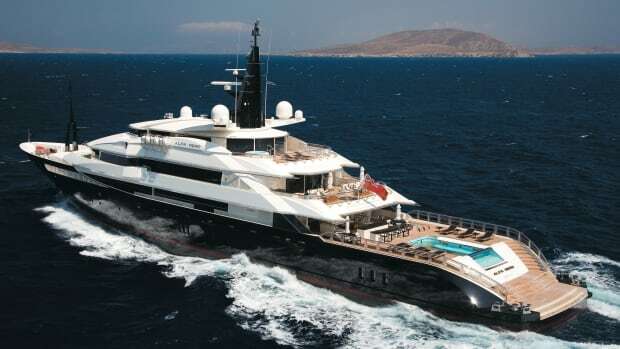 The shipyard’s engineering team devised the much talked about pool/helipad on Alfa Nero’s aft deck, a feature that also is in the plans for Oceanco’s Y-708 project fresh off the drawing boards. 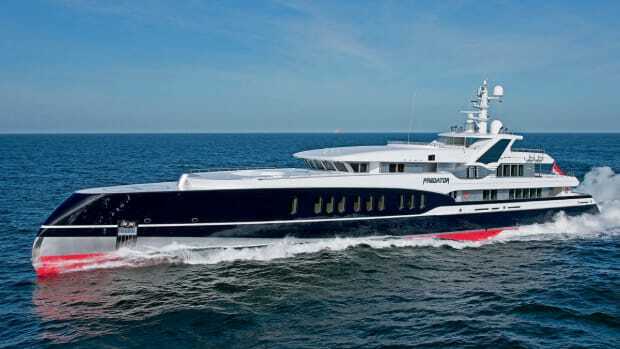 Sorgiovanni, who was at the Ablasserdam shipyard during a press visit a few weeks before launch, said he adapted one of his concepts for the yacht’s owners, who selected the design from his portfolio. 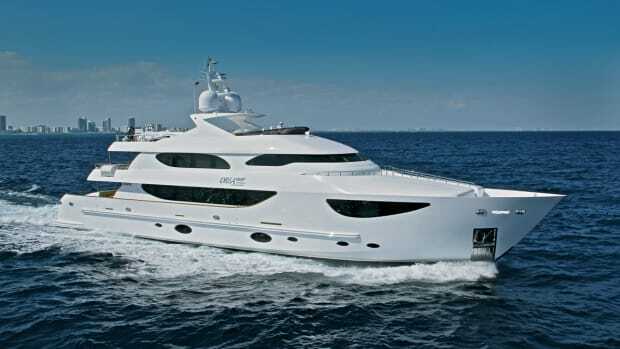 The Australian designer worked closely with the late John Bannenberg, who beginning in the late 1980s created daring designs for the Australian yacht builder Oceanfast. 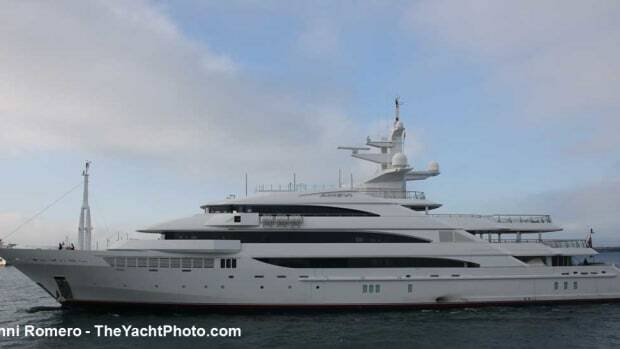 Indeed, some of Anastasia’s exterior design elements, including the wing-like features on the top deck and a series of louvered panels akin to a shark’s gills on the yacht’s superstructure, may ring a bell. Nevertheless, Anastasia’s design ultimately is the result of a close collaboration between the owner and a designer whose goal was to create a timeless design and a decor that would meet the owner’s request for a beach house feel and an abundance of space for watercraft. The yacht’s interior, which makes interesting use of natural textures and materials such as bamboo, eucalyptus, natural stone colors and crocodile print, is well suited for Anastasia’s dual purpose as a personal and occasional charter vessel. The owners enjoy enviable privacy with a two-level master suite, accessible through a stunning high-ceiling study on the upper deck. The master stateroom, with ensuite bathroom and a private balcony, occupies its own deck and enjoys panoramic views through wraparound vertical windows. Likewise, the sundeck is very private, allowing guests to enjoy the sun, a superbly equipped air-conditioned gym and a large Jacuzzi surrounded by a comfortable cushioned sunbathing salon from where they can see but not be seen. The owners are fitness fans and the yacht does not have an elevator. Instead, all decks are accessible via a spiral staircase that wraps around a stunning blown-glass sculpture, lit from the inside, the work of the Czech company Sans Souci. Many other options for onboard entertainment and offshore excursions are available. 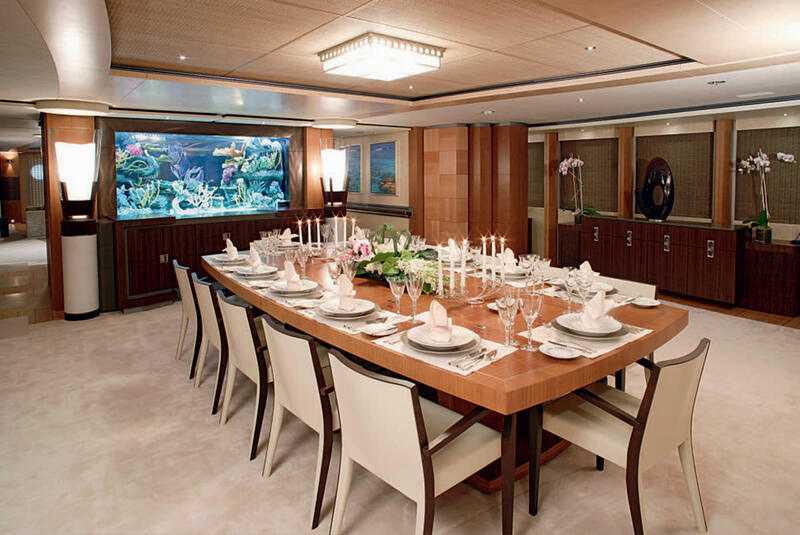 The main-deck salon, which features a 700-gallon tropical aquarium as a visually pleasing divider set atop a bar between the seating area and the dining room, may be transformed into a disco. Integrated in the salon’s ceiling is a system that produces a light show. The carpet can be quickly rolled, the furniture pushed away, and a smoke machine and topnotch entertainment system engaged to transform the pleasant but subdued daytime salon into a glitzy nightclub. The large sundeck’s aft area, set mostly with movable furniture, transforms into an outdoor concert area. The yacht’s lower deck includes a cinema with fully reclining seats complete with footrests, a gigantic screen, and floor-to-ceiling speakers that provide outstanding sound. 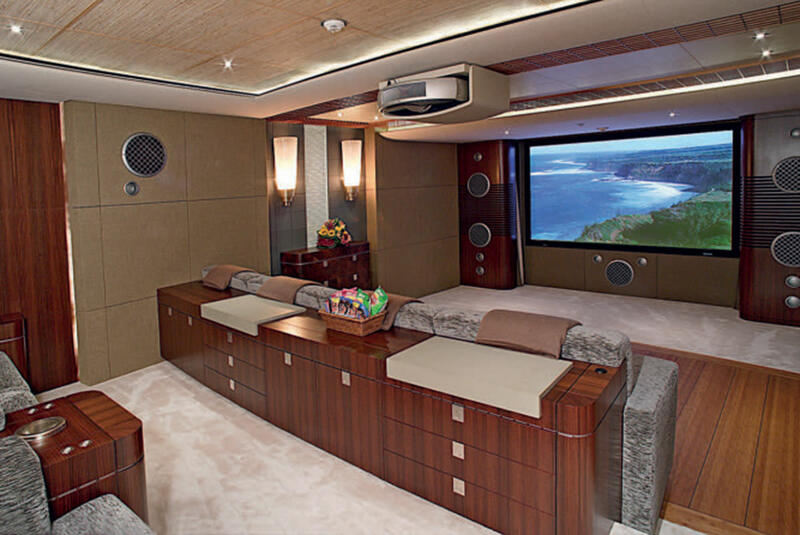 The extensive movie collection, which is accessible throughout the yacht, is unlikely to call for too many reruns. Guests who may want to get ashore can do so easily using one of two 31’ custom Vikal tenders stored in an immaculate and spacious garage. The floor is finished in a synthetic material by Bolidt, which imitates teak for easier maintenance and good looks. Two side doors allow launching the tenders, perhaps not a novel but certainly a practical and elegant design. There is additional room for a battery of water toys that includes four Wave Runners and six Jet Skis, windsurfers and a speedy Malibu Wake tender for waterskiing. Just aft of the garage, and accessible via the transom door, is a large and well-organized lazarette to prepare guests for water activities, including diving. 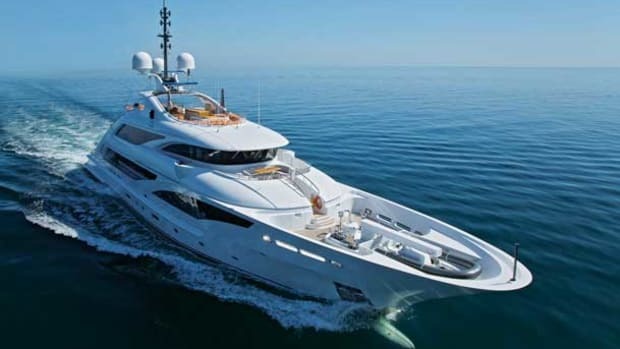 The yacht accommodates a crew of 20 to cater to the needs of a maximum 12 passengers. Crew quarters are located forward on the lower deck and include a large crew mess. 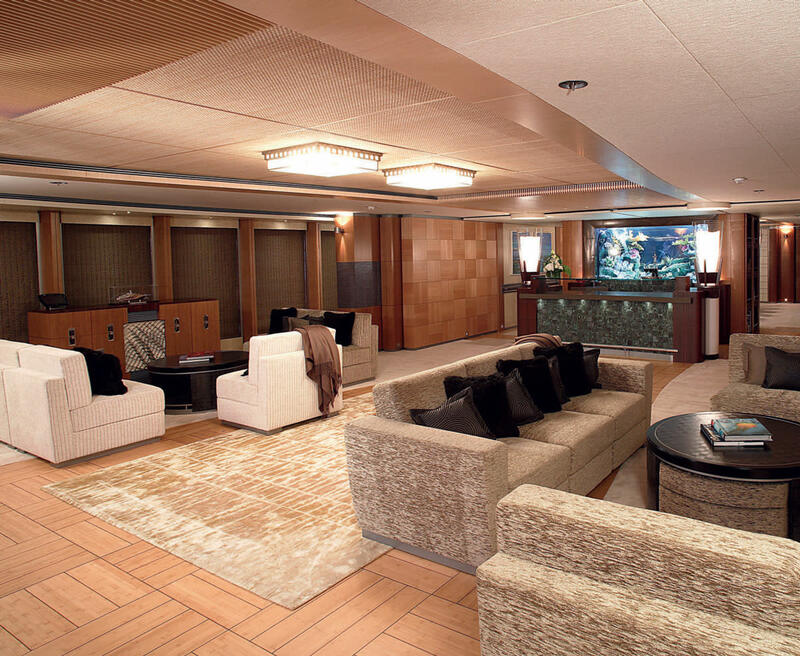 Unlike on so many other yachts guest and VIP suites are not on the lower deck. 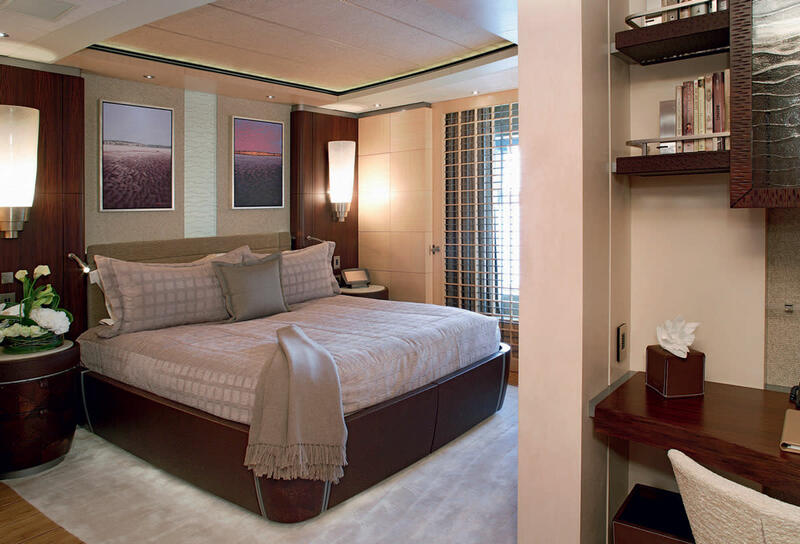 Four staterooms occupy the desirable forward main-deck area usually reserved for the master suite, and an additional suite is located on the bridge deck near the lower entrance to the master suite, making it an ideal candidate as a staff or nanny room. The captain’s cabin is just aft of the bridge. Vertical windows provide ample visibility from the helm, which is of strictly professional quality as expected. Two pilot chairs, fully adjustable, are located on either side of a full-size map table and facing a complete console displaying information on a battery of easy-to-read vertical screens. 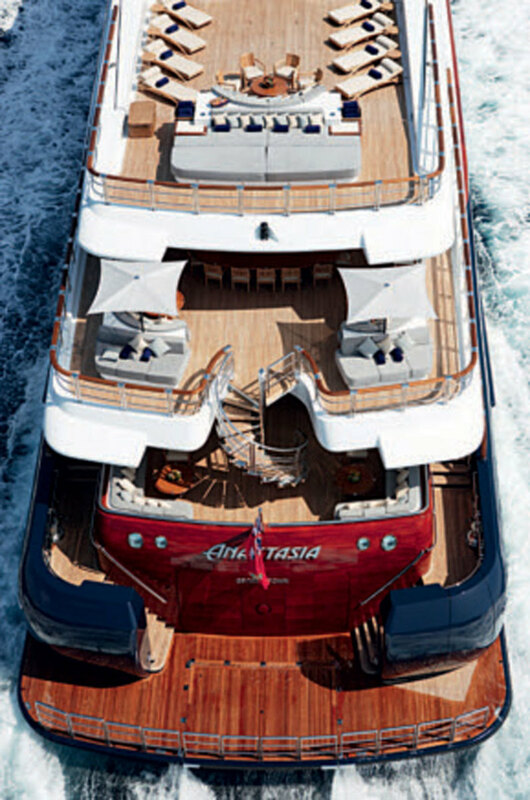 Anastasia delivers a 16.5- knot cruising speed and has a 51,000-gallon fuel reserve enabling oceanic crossings. The immaculate engine room has obviously received a great deal of attention, and is spacious and well organized around the two large 4000 Series MTU diesel engines. YI: What were your guiding principles in creating the design? Sam S: The design brief from the owners was very clear. They wanted a timeless and elegant design that was unique and individual. My interpretation of this brief was to create a distinctive look that was neither trendy nor futuristic but rather presented a sophisticated blend of timeless influences with a modern interpretation. I incorporated wood and classic shapes that have a connection with the past but interpreted in a form that is very clearly modern and progressive. YI: What contributes to making the design timeless? Sam S: It’s the link with a classic form that incorporates elements such as the elongated bow, flowing sheer line, and the wood effect on the cap rail and transom. The combination of all these elements helps to create a look that is instantly “Classic" but with a modern twist. YI: How did you achieve the line? Is there an LOA to LWL ratio for instance that is very distinct from more conventional modern yacht designs? Sam S: The yacht was originally designed at over 80m in length so it was not an easy task to reduce its length and maintain its classic sleek profile. There are some key elements to its design that I consciously incorporated to visually create the elusion of length and sleekness. 1. The yacht’s overall height was reduced by making the owners’ deck a raised deck above the upper deck instead of a full deck above the upper deck. This has contributed to a sleeker superstructure especially from the front on, where the wheelhouse and owners’ decks overlap gracefully to give a less bulky appearance to the superstructure. The “funnels” also help to hide the gymnasium; this also gives less visual height to the yacht. 2. The timber cap rail that flows from the bow all the way aft separates the dark hull from the superstructure. This helps reduce the height visually and also enhances the length of the vessel. 3.The elongated bow creates not only an elegant classic shape but also helps adding length and sharpness to the hull and provides a much sleeker looking shape forward. YI: What are some unconventional materials used on the yacht&apos;s interior? Sam S: The brief for the interior was the same as the exterior, timeless but comfortable, reflecting the casual nature of the yacht’s owners. My intention was to only use materials with a natural appearance. So we eliminated the use of gloss and instead I tried to allow all materials to have a natural appearance and texture. Texture was very important to create that comfortable holiday feel, which is not unlike a beach house. Some of the materials we used were carved bamboo flooring, woven sea grass, imitation crocodile and ostrich skins, natural wood veneers, coconut shell, antiqued metals, silk carpet, special paint finishes, natural stones and unique art pieces. YI: How much does your environment in Australia influence your selection of materials, if at all? Sam S: I guess a lot. The Australian way of life has many similarities with yachting because of our natural connection with the environment and in particular the sea and ocean. The casual interaction of indoors and outdoors is very important on a yacht and also in Australia. I incorporate this understanding and appreciation of this interaction into my interiors. In terms of style, Australia is very unique as we have the rich influence of all cultures including those from Europe and Asia. I believe that my interior style brings this together in such a way that it achieves that difficult balance between user friendly and practical but also between elegance and timelessness. I believe that it&apos;s my environment that has given me this unique appreciation and exposure to different cultures and styles of living with the sun and water. YI: How much work did you do on site at Oceanco? How was it working with the shipyard? Sam S: We at SSD spent considerable time with the yard, which included may site visits. It’s important to provide the yard with a very comprehensive package of information, which we did. It included a 3D model of the yacht exterior and virtually every possible plan, section and elevation off the yacht’s interior was fully developed from our office. Its this level of detail that I believe contributed greatly to making the interior of Anastasia very special. That said, it was the enthusiasm and great skill of the Oceanco team and subcontractors that made all our ideas a reality. 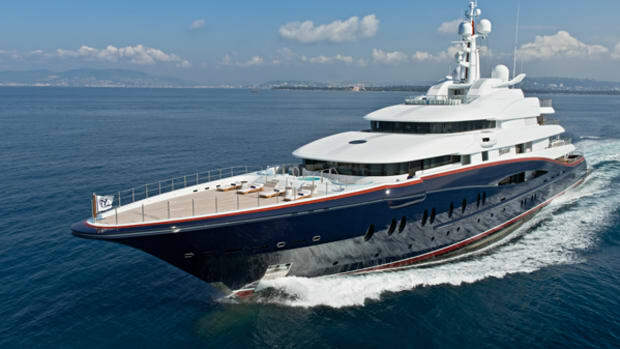 I have worked with many yards over the years but Oceanco is without a doubt one of the best I have ever worked with. The team under the direction of Eel Kant and Marcel Onkenhout is enthusiastic and passionate... Anastasia is a true reflection of that enthusiasm and collaboration and one that we are keen to repeat.